Toilet Twinning – what you might ask? Soroptimist International Ipswich & District raffled this lovely quilt made by a former member at the Women’s Voices, Women’s Votes Festival in October 2018 to raise funds for Lighthouse Women’s Aid. We raised £100, and the winner, Jan Fish, received the quilt from Cllr Jane Riley, Mayor of Ipswich, at our club meeting on 14th November, when the Mayor joined us to talk about her year and her interest in the smaller charity groups that do so much for the community. At the meeting we also collected 18 filled toiletry bags for Lighthouse, making 30+ for the year. This we do each year as ongoing support for the women who find themselves in need to use the refuge. If you would like any other information about our Club please contact us via this site. Ipswich Soroptimists are proud to have been involved in Women’s Voices, Women’s Votes 100 years on. See our Club News for more photos and a r eview of the event. It was amazing. Go to the Festival’s website: www.womensvoiceswomensvotes.wordpress.com for more information. IPSWICH AND DISTRICT club was established over 60 years ago and our meetings take place on the 2nd Wednesday of each month in the historic surroundings of the Ipswich and Suffolk Club in Northgate Street, Ipswich. Originally the Archdeacon’s House, we are delighted to be able to use this listed building which provides us with safe, ample parking and good facilities for our monthly meetings. As a forward thinking club, it is our aim to develop a club where members contribute their skills and talents and work together to meet the objects of Soroptimism in an effective and relevant way for women today. At the heart of what we do is a strong commitment towards Programme Action projects, raising our profile within the community and the Region as well as attracting new members to our vibrant club. Where you will find our club slightly different to some is that we decided as a group, to work closely as a team and share responsibilities and ideas. We are all too aware that commitments on our time as busy women today means that sharing some of the key roles within the club makes things a little bit more manageable and enjoyable. A strong club with a established history, we know that having fun is an essential element of enjoying our membership, whether through interesting meetings, working together on Programme Action projects or outside activities. 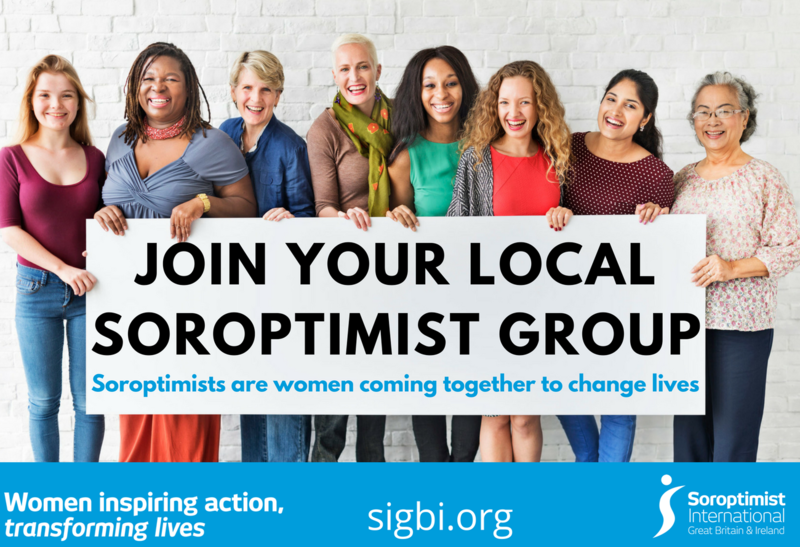 There are many reasons why our members are Soroptimists – If you are interested in finding out more or would like to come along to a meeting to see what it is like, contact us and we will be delighted to welcome you. Email Pat at ipswichsoroptimists44@gmail.com or Jackie at jacalan@btopenworld.com. Our next meeting is on 12th September 2018 when we will be discussing our Book Reading of the Year ‘A Song of Their Own’ by Joy Bounds, the lead person for the Festival Women’s Voices, Women’s Votes. This will follow a supper at the Ipswich & Suffolk Club.